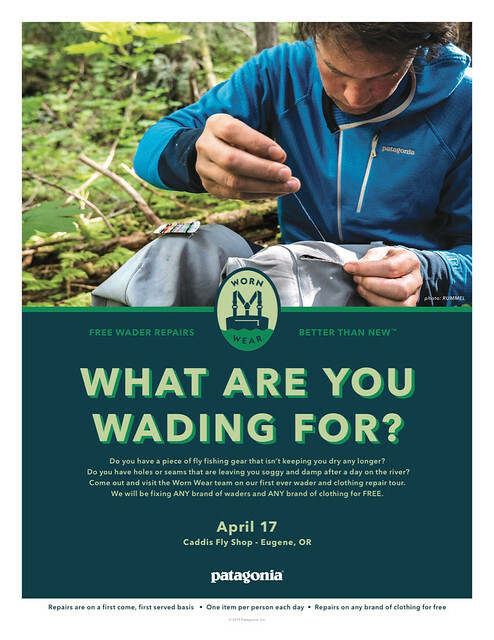 The Patagonia Worn Wear Mobile Tour will be stopping by the Caddis Fly on April 17th. The Worn Wear Team will be available to repair any and all brands of gear from 10am to 4pm on April 17th, 2019. Extending the life of our garments is the single most important thing we can do to lower our impact on the planet. In keeping our clothes in use longer, we reduce overall consumption. Today, we’re proud to launch a cross-country mission to change people’s relationship with stuff. The Worn Wear Mobile Tour, kicking off April 2 in Ventura, Calif., and ending May 12 in Boston, is our attempt to encourage customers to make their clothes last a lifetime. As part of the tour, we’re bringing repair staff from Patagonia’s repair facility in Reno, Nev., on the road to offer free repairs on busted zippers, rips, tears, buttons, pulls and more – in addition to teaching people how to fix their own gear. Used Patagonia items will be for sale. The tour will be stopping at a myriad of locations such as retail locations, coffee shops, farmers markets and trailheads. Patagonia’s Worn Wear program was created in 2013 as a way to encourage people to take good care of their gear, washing and repairing as needed. The program aims to keep clothing, regardless of brand, in circulation for as long as possible. When it’s time for a replacement, we want you to invest in something that lasts. That’s why Patagonia makes the best quality, most functional products in the world, guarantees them for life and owns the biggest garment repair facility in North America. And it’s why were going on tour – bringing Worn Wear’s critical message to communities across the country. The Worn Wear Wagon is a one-of-a-kind custom vehicle, created by artist/surfer Jay Nelson. The solar-powered camper shell is made from redwood salvaged from giant wine barrels and mounted on a ’91 Dodge Cummins fueled by biodiesel. The mobile repair shop, complete with an Industrial Juki sewing machine, will be open to anyone who brings in a garment, regardless of brand. The tour will aim to educate visitors about the philosophy behind Patagonia’s Worn Wear program. This entry was posted in Fly Fishing Gear Review, Fly Fishing Profiles, Oregon Conservation News. Bookmark the permalink.